“We don’t have a heart for humans and a heart for animals. We have one heart or none at all”. When people visit Egypt, they usually come to have a good time. They want to gasp at the enormity of the Pyramids, lay on the beach in Sharm el Sheikh, spend an afternoon in the Egyptian Museum, visit the tombs in Luxor or sail down the Nile in a felucca. After all, they are on holiday, and they don’t really want to see the “other side” of the country they’re visiting. But if you leave your 5 star hotel, if you venture beyond the tourist sites, there is a whole different side to Egypt. Perhaps you will see the garbage lining the streets, the poverty, the people living on rooftops, or the children playing in the garbage with no shoes. Perhaps also, you will see the widespread animal abuse. But while the issue of animal abuse is indeed a common problem, it is important to know that not everyone is indifferent to their fate. There are some great institutions that try to save animals from abuse, and educate the people about how to treat their animals. To be able to understand the issues and circumstances that underpin the bad attitude towards animals in Egypt, and to find out what can be done about it, I spoke to Amina Abaza from the organization S.P.A.R.E. (www.sparelives.org). Living proof that Egyptians do care about animals, she has personally founded the organization that saves, adopts, treats and takes care of animals in its own shelter in Saqarra, outside Cairo. 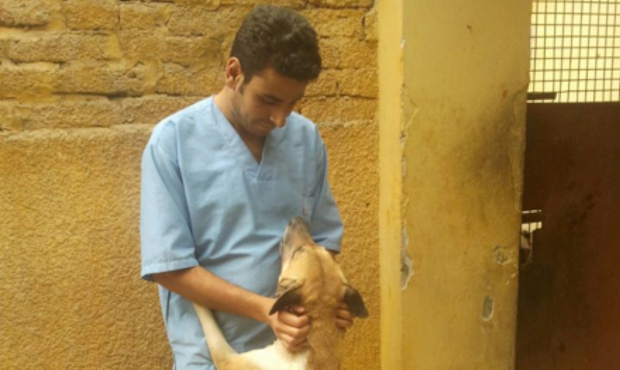 Apart from setting up the shelter and the organization, Amina also saves animals herself. If she sees an animal being abused or maltreated, this fierce lady will not hesitate to cause a scene, and to personally tell the owner off for his behaviour. She then proceeds to either buy the abused animal from the owner or simply confiscate it. Not afraid to tell it like it is, Amina Abaza is the ideal person to shed some light on the problem of animal abuse in Egypt, and what needs to be done about it. Amina (middle) and the team of vets at the shelter. YME: When did you start setting up SPARE, and why? AA: Well, I officially set up SPARE twelve years ago, but my love for animals really started at a young age. Even when I was six or seven, it was a natural thing for me. One traumatic experience has been very important in my desire to protect animals, and it has stayed with me all my life. I remember when I was eight or nine, I took the bus to school every day, and every day there was a white stray dog waiting for me. She became my best friend, and I was looking forward to seeing her every day. One night I heard gun shots (the Ministry of Interior used to shoot stray dogs at night) and a terrible scream coming from a dog. The next day, my dog wasn’t there. I then realized that it had been her that was shot. I was heart-broken. That really made something click in my heart and I realized that I really had to do something about this when I was bigger and powerful. After I got married, my husband saw that I was unhappy about the animal abuse that took place right under my nose, and he told me “stop crying, you can help, go do something about it”. I told him that people would think I was crazy for doing something for animals in a poor country like Egypt, but my husband found this cheap plot of land and we decided to build the SPARE shelter. YME: What were the reactions of the general public like when you opened the shelter? AA: There was a lot of skepticism, even from my own family members. They didn’t understand that I decided to set something up for animals, and not for, say, orphans, or poor people. I received a lot of mocking and I was even invited to television shows where I was ridiculed. However, after a few years people saw that I was serious about it and that the shelter was there to stay, and they became less skeptical. I got better at answering back to skeptics and they couldn’t ridicule me as before, because I simply put them in their place with facts and arguments. What also helped is that in the current resurgence of religion in Egypt, I talked to people about how Islam orders people to treat animals well. This is a serious and important issue in Islam, and people are not aware of it. Many religious people today are religious only in their practices, they fast, they pray they have the zebibah (the brown spot on the forehead that comes from praying a lot), it’s all about showing off. People need to be more religious in spirit, caring for each other and also for animals. However, now that people are so focused on religion in this country, I can use that to urge them to take “religious responsibility” and treat animals well. When they think it is haram to beat an animal, they are less likely to do it, for fear of God. One of the vets treating a horse at the shelter. YME: Why do you think people here treat animals so badly? AA: It has to do with two things: ignorance and indifference. When the vets at SPARE ask the owners of abused and sick animals why they treat them so horribly, or why they hadn’t brought the animal to the vet before, the owners will just shrug their shoulders and say that they don’t care because they can easily buy another one. They put a chain around the nose of the horse or donkey because it is a very soft and sensitive area and so they use the chain to control and lead the donkey or horse by deliberately hurting the animal’s nose. They don’t care that the animal is suffering, it is simply a matter of money and using the animal like a machine. But at the same time, they are just stupid people because when they mistreat their animal, it is going to have a shorter life and they will have to buy a new one sooner. However, they can’t think long term like that, they don’t care about how it is going to cost them in the future. At the same time, people don’t know very much about animals at all. They have their own mistaken “treatments” that they use on their animals, that actually make it worse. For example, they believe that they can cure problems with lameness of the legs of donkeys by burning the skin on the leg, and creating a wound that would “heal the lameness”. This is ridiculous, but people are ignorant about these issues. They also cut off the ears and tail of dogs without anesthesia because they believe that this makes the dog a good guard dog. They think that if the dog looks like a Doberman it will become like a Doberman. Also, many people don’t realize that animals can feel pain, so they play with them like they are just objects, not living things with feelings. Children play football with cats because they think it’s funny, it’s playing, but they don’t realize that the cat is suffering. However, I have to stress that there are also good people here, who do care about animals, and who bring animals to us, and try to help. Only last week, a little boy brought a cat over to the shelter because he wanted us to help it. These things give us hope. YME: What are the most common problems with the animals that you encounter in your work? AA: Most the problems with the animals we encounter are “man–made”. We generally find them in a really bad state, saving them from being drowned or being beaten or strangled by their owners. With cats and dogs there are problems with worms and parasites and infections, concussions (because kids “play” with cats by smashing it against a wall) and of course, chronic malnutrition. The active abuse may take the form of beating, burning the skin of an animal or even letting it work with a broken leg! Most common are large wounds to the animal’s skin from bad saddles, too heavy loads, rashes, burns and problems with the joints and fractures that have not been treated properly. Many problems are exacerbated by infections, because owners do not have the animal treated in time because they can’t be bothered. They rather let an animal die than pay for a treatment, and even if they do come to us, they really only bring their animals when they are almost dying, even though we treat them for free when the owners are poor! Amina treats the eyes of a donkey at the donkey shelter in Saqarra. YME: What is the role of tourists in the abuse of animals in Egypt? AA: Tourists are often enablers without knowing it. For example, at the Pyramids, they can ride donkeys or horses around the premises, and of course that is a lot of fun! But because they cannot see the wounds that donkeys have under their saddles, they cannot see how they are damaging the animal. Also, I sometimes see people who are very heavy riding a tiny little donkey, and this is just not right, it is too much! You should not ride a small animal like that when you are that heavy. But most of it is ignorance, people simply don’t realize how much the animals are suffering. So, I want to tell these tourists, I beg them, please check if the animal is too skinny, if their legs are ok, and lift up the saddle, or the blankets on a donkey and see if they have wounds underneath. If they do, tell the owner off and go and find an owner who does treat his animals well, and take a ride with him. Because if the animals are healthy, there is nothing wrong with riding them for fun! This way, the people learn that it pays to treat their animals well because tourists will refuse to do business with them if their animals are suffering. AA: What do you think about the donkey/horse feeding programs at the Pyramids that are set up to support the animals in these times of crisis, when there are so few tourists coming to Egypt? YME: First of all, the owners weren’t feeding their animals well even before the tourists stopped coming. They always made more than enough money from the tourists, in fact they are relatively rich in Egyptian society. Still they never gave their animals enough food, because they are only interested in the money and don’t care about their animal’s welfare. They squeeze every bit of energy out of the donkeys and horses, and they refuse to feed them properly, even if the donkey’s food is only 25 piasters a pound. When the tourists stopped coming, the owners punished the animals for it, and as they didn’t see any use in their animals anymore they left many of them behind in the desert to die! These people are cruel, selfish and crazy. SPARE did not have the means to participate in the feeding program but I personally think it is not even that useful because these owners are just liars, they will use the program to substitute their own feeding and then lie and play the victim, saying that they don’t have enough money to feed their animals, even if they have plenty of money. Again though, tourists can play a big part in solving the problem of maltreatment and malnutrition, because if they refuse to ride a skinny horse or donkey, the owner will have to start feeding the animal in order to get business. It is very important for tourists to know that they can do something. YME: What has been the role of the government in the problem of animal abuse, and how could they play a role in fighting it? AA: The government really hasn’t cared at all about the problem of animal abuse, even though it happens so much. They have a conference every now and then to show their good intentions, but it is all talk, no action. They don’t really care about the issue. In fact, they are a big part of the problem and give a big example, because they commit crimes against animals as well. When they want to get rid of the many stray dogs in Cairo for example, they simply go out at night and just shoot them. Besides shooting them, they have an even worse method of killing them, which is by putting poison in the garbage that lines the streets of Cairo. Stray dogs find their food there so they get poisoned. But this is not even a normal, quick-acting poison, they use Strychnine, which is actually illegal because it causes so much suffering to the victim. Strychnine is cheap and available on the black market so the Egyptian government doesn’t care that it causes the dogs so much pain, they are only interested in solving the problem for as little money as possible. In fact, it can take up to an agonizing three days for the dog to die, all the while his intestines are shredded up and his organs are failing, the poison literally eats away everything. Of course, what the government could know but is too stupid to realize is that if there was not so much garbage on the streets there would be fewer stray dogs, and that the real solution is to break the cycle of reproduction and neuter them instead of killing them off so cruelly. YME: Do you think with the Revolution possibly over, the new government will push for an improvement in the situation or will it get worse? AA: I think it will get better, because hopefully, the educational system will get better and people will be taught that they cannot abuse animals. In Egyptian society, animals are seen as something to use, something to make money off or to use for guarding a house, they don’t see them as living beings, this has to change. Hopefully, when there is more awareness, the new generation will understand that animals can feel pain and that they are not just objects. Education really is key to understanding and improving the situation of animals in Egypt. YME: What do you think needs to be done to improve the situation and to fight animal abuse in Egypt? AA: First of all, we need to create more awareness. Many people do not understand anything about animals and how to treat them. As we have 40% illiteracy in this country, people cannot read about it in our flyers, so what we need is a television ad. There have been examples of social campaigns (for example against child dehydration) that have been very successful because all Egyptians watch television a lot. We need to use that medium too but it is extremely expensive, unfortunately, and we do not have the money to do that. However, the key is awareness and education. For this, we need to make people understand their own religion, and its stance on animal treatment. Once people understand that it is important to treat animals well, both from an ethical and from a religious perspective, they will change. YME: How can people help SPARE and the animals in the shelter? AA: First of all, people can always donate to SPARE. On our website (www.sparelives.org) there is a PayPal link where people can donate money. Second, there is the option of adopting an animal from SPARE. If adoption is a step too far, you can always sponsor an animal for as little as 8 dollars (5 GBP) a month. You can find all the information on adopting and sponsoring on our website.